Open: 9 a.m. to 6 p.m. in summer; 9 a.m. to 3 p.m. in winter. Closed for inclement weather. Entry fee: $7 for adults 17 and up, $5 for children ages 6 to 16. Under 5: free. Cash or personal/travelers checks are accepted at park entrance station. No credit cards. Bodie State Historic Park is a ghost town on the eastern edge of California, over the Sierra Mountains and past the tufa spires of Mono Lake. The desert is excruciatingly hot in the summer and difficult to reach in winter, when the pass through Yosemite snows closed. In its brief heyday, 10,000 people lived and worked in over 2,000 structures in Bodie. Miners who’d chosen to take stock rather than wages brought home $880 a week. One month in the 1880s, miners dug out $600,000 in gold and silver. The total haul reached $30 million in gold, $1 million in silver. Between the time the last working mine closed in 1947 and the ghost town’s induction into the state park system in 1962, Bodie effectively vanished from the map like Bonny Doon. Despite the rage for Gene Autry, Roy Rogers, and the cowboys of early television, Bodie survived in a west too wild to be inviting. Though it had once been fabulously wealthy, Bodie offered no amenities to middle-class families traveling in the Eisenhower years. It stands a long way from anywhere. The road into town continues to be passable only to motor vehicles traveling at five miles per hour. Bodie still boasts no lodging or working restaurants. Currently, Bodie has been designated the best-preserved ghost town in America. Up to 200,000 people visit it annually. Its 170 surviving buildings stand in a state of arrested decay. Nothing is being restored; at the same time, nothing is allowed to tumble to the ground. Overseen by the California Park Service, Bodie State Historic Park’s highlights include an undertaker’s parlor, complete with fully stocked coffin showroom; the last standing church, scoured of whitewash by the gritty winds; several gambling houses, still furnished with roulette wheels and billiard tables; and one of the gold mills which day and night pounded the city’s wealth from the hard quartz. During the boom times, gunfights broke out weekly, if not daily. Mine accidents occurred repeatedly. Childhood could be brutal. With life so uncertain in Bodie, the extensive graveyard that overlooks the town is in fact five cemeteries adjacent to one another. The first is Wards Cemetery, the main city graveyard. Directly behind that lies the Masonic Cemetery, followed by the Miners Union Cemetery. West of the perimeter fence remain the Chinese, excluded from the proper graveyards. Whenever Chinese immigrants died in California, they wanted to be buried only long enough for their remains to become skeletonized. The surviving Chinese in the area were supposed to open the graves, collect the bones, and return them to their homeland, where they could rest with their ancestors. Unfortunately, because of violent prejudice and the transient nature of the Gold Rush boomtowns, many Chinese linger in their original graves. 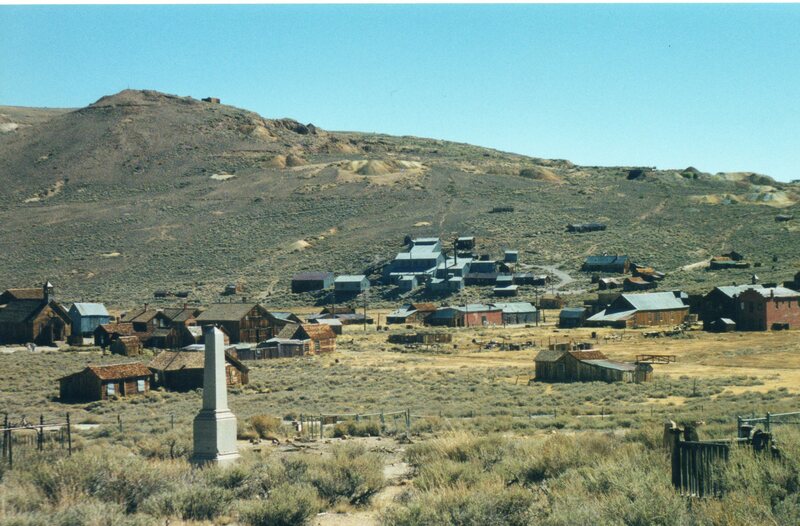 The Friends of Bodie’s cemetery brochure estimates that several hundred Chinese were — and are — buried in Bodie. The final cemetery on the hill shelters the outcasts: gunmen, illegitimate children, and prostitutes, all those shunned by “respectable” folk. Only wooden posts or heaps of rocks ever marked most of those graves. Now the only marker visible is fairly modern. A cement tablet, stamped with a rough cross and her name handwritten in shaky letters, remembers Rosa May, a prostitute who died while nursing miners during a pneumonia epidemic. Inside the proper cemeteries, a surprising amount endures. Some of the plots still sport split-rail fences. Beautiful ironwork, imported from as far away as Terre Haute, Indiana surrounds others. The lonely fences, like the frames of vacant beds, punctuate the sagebrush-covered hills and underscore the vast, silent isolation of the dead who’ve been left behind. One of the most beautiful monuments has a child-sized marble angel leaning against a scroll to the memory of Evelyn Myers. A month shy of her fourth birthday, Evelyn’s folks had a drainage ditch dug around their home. Curious little Evelyn leaned over the railing on the porch to watch the workman. Without looking over his shoulder, he brought his pick back and crushed her skull. Bodie’s museum in the former Miners Union Hall displays a clipping from the Bridgeport Chronicle, which reported, “A sad accident occurred in Bodie…which has enlisted the sympathies of the people of the entire county for the bereaved parents…. The funeral took place on Wednesday, the attendance showing the deep sympathy of the people, with whom she was a great favorite, being a most beautiful and lovable child.” Although her name wasn’t mentioned in the story, her father Albert K. Myers operated the general store, according to a bookmark I picked up in the museum’s gift shop. Everyone in town must have known him. If Evelyn’s parents lie in the graveyard, they’re in unmarked graves. More likely, they moved away and left their beloved child behind. Bodie’s namesake has only been shown proper deference in later years, although confusion lingers over his real name. When “Bill Body” made his initial discovery in 1859, richer diggings in Virginia City and elsewhere overshadowed it. In the winter of 1860, Body (or Bodey) got caught outside his cabin by a snowstorm and froze to death. Coyotes stripped his flesh before his partner found him in the spring. Not until 1879 did the city fathers reclaim his body from its shallow grave and transfer it to Wards Cemetery. Townsfolk ordered a granite monument to celebrate him, but before it could be placed on his grave, U.S. President James A. Garfield was assassinated. Swept up in the national mourning, Bodie’s citizens co-opted Body’s monument and rededicated it as a cenotaph to the slain president. August 13, 2011 is Friends of Bodie Day: special tours, BBQ, live music and horseless carriages. Tickets are available here. This entry was posted in Cemetery event, Cemetery of the Week, Wish You Were Here and tagged Bodie State Historic Park, California cemeteries, ghost town, Gold Rush cemetery. Bookmark the permalink.